Hammer-wielding carer, 52, who wore a lace disguise over her face as she tried to kill a 90-year-old widow and steal £30,000 is jailed for 21 years..
A carer who wore a lace disguise over her face as she tried to kill a 90-year-old widow and steal £30,000 was jailed for 21 years today. 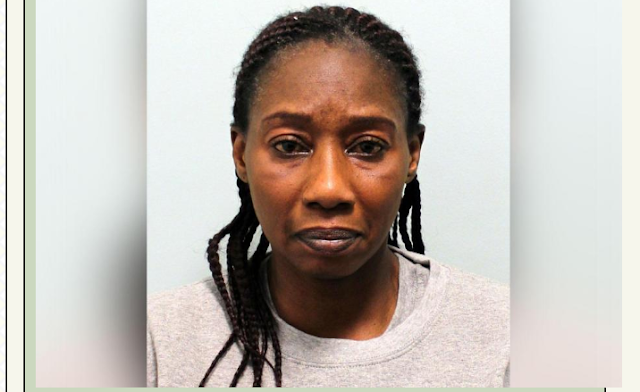 Abosede Adeyinka, 52, attacked Pamela Batten with a knife and a hammer after husband Ernest had hidden the cash in bags at their home in Yiewsley, west London. The frail pensioner was stabbed in the neck during the attack on April 27 this year and was only saved by emergency surgery by doctors at at St Mary's Hospital, Paddington. Adeyinka looked after Mrs Batten's husband Ernest from 2013 until his death in October last year, a court heard. Mrs Batten grew frustrated with Adeyinka's time keeping and often called her agency to find out where she was. After Ernest passed away, Adeyinka went to the widow's home and knocked her to the floor. Mrs Batten said: 'She tried to hit me with a hammer'. Following a trial at Blackfriars Crown Court, a jury convicted Adeyinka of attempted murder. She was cleared of possessing a kitchen knife after jurors could not be sure she took the blade with her. Adeyinka shook her head in disbelief at the verdicts were given and wept loudly as Judge Peter Clarke, QC, said she had shown 'a complete lack of remorse'. She has convictions dating back to the 1990s for offences of assault, burglary and theft from an employer. Prosecutor Kevin Barry told the court the widow 'was afraid to go home' following her discharge from hospital and now needs a zimmer-frame to walk. 'Before the attack she felt lonely because her husband had died but she was not afraid like she is now,' he said. 'The hammer blows to her head have affected the vision in her right eye which is now blurry. Jailing Adeyinka for 21 years Judge Peter Clarke, QC, said: 'Pamela Batten was mentally sprightly and six months after his death she still had no idea that her husband had squirrelled away over £30,000 in cash around the house. 'From what you did on 27 April there is every reason to believe that you knew more about that money than Mrs Batten did. The judge added: 'Although you were wearing a lace disguise over your face I am satisfied on her evidence that she called you by name. Speaking after the court hearing, investigating officer DC James Harbour said: 'This was a vile and disgusting crime on a defenceless grandmother in her own home.